As the successor of the IC-F25SR, the IC-F27SR retains the “simple to use” philosophy with the nonkeypad and non-LCD appearance which can be used with little or no training. 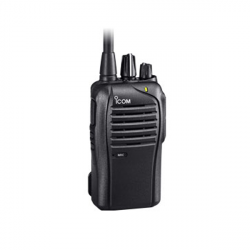 The IC-F27SR provides 800mW (typical) loud and intelligible audio, built-in VOX functions and longer operating time. High Performance, Professional Licence Free Radio. Outstanding audio quality, high performance and commercial build make the IC-F27SR the ideal licence free radio. This licence free radio is ideal for users in diverse areas such as construction, catering, event management, shopping centres, factories, farms as well as serious outdoor enthusiasts. It has durable and reliable construction to withstand serious usage for a long time. 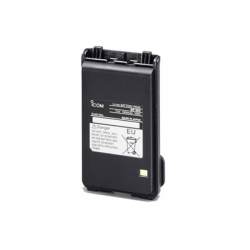 The IC-F27SR features highly efficient circuitry, providing up to a massive 35.5 hours of operating time* with the supplied BP-265 2000mAh lithium-ion battery pack. This means it can be comfortably last an entire shift. 800mW audio output is provided from the large 45mm speaker meaning the IC-F27SR can deliver loud and intelligible audio even in extremely noisy environments such as a busy shop floor or construction site. Easily fits into your shirt pocket. 58 x 186* x 36.5 mm (*Includes antenna) compact dimensions and 285 g.(Includes BP-265). Small size and lightweight (285g) makes this transceiver ideal for all users. The large PTT button is designed to provide non-slip, confident-click, even when wearing gloves. The IC-F27SR delivers 500mW (ERP) output power and provides up to 3km* (approx.) coverage. * Depending on the operating environment, weather conditions, etc. It has a 16-position rotary selector with pre-programmed memory channels (8+8). CTCSS (or DTCS) group code can be programmed by yourself. Two key functions can be programmed by yourself cloning software. Programmable items are Scan, Priority, Memory, Key lock, Surveillance and Siren functions. Built-in VOX function provides convenient hands-free operation, when used with optional headset with plug adapter cable OPC-2004. The radio is tested to IP54 and 11 categories of MIL-STD 810 F environmental tests. *Tx: Rx: Stand-by=5:5:90. Power save function ON. ICOM headset interface cables adapt your headset to your radio. 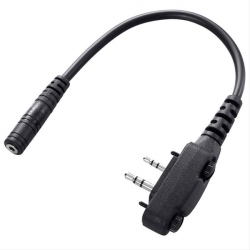 These adapter cables allow you to use your HS-Series single pin headsets with your mobile radios. 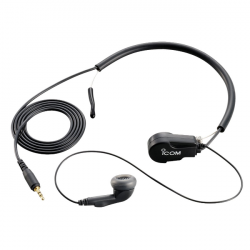 Headsets let you hear more clearly, so get yours connected properly with ICOM headset interface cables. OPC-2006 is required when using the HS-94, H95 S-and HS-97 with some transceivers. OPC-2004 is required when using the HS-94, HS-95 and HS-97 with some transceivers. The SP-27 features a clear acoustic tube that is designed to be hidden behind the ear making it hard to see. This makes it an ideal earphone for security, hotels, restaurants, retail and airports. 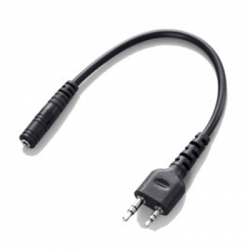 1m length cord with 3.5mm threaded connector. Compatible with a range of Icom Amateur, PMR and Receiver Products. Features Hands-free operation. Requires VS-1/1L/1SL VOX unit for use. Reversible earpiece lets you wear the headset over either ear. Ear hook wraps behind the ear for a snug fit. Flexible gooseneck microphone booms lets you adjust the microphone's position so the other station hear you more clearly. O Lapel clip lets you securely clip the headset's cord to your clothing. Allows you hands-free operation. This headset is designed for combination together with the optional VS-1 PTT/VOX unit. The HS-94 headset provides portable, convenient communication that lets you keep your hands free while operating in the field, etc. The headset connects easily to VS-1 PTT/VOX unit. IC-F27SR - use with either VS-4LA or OPC-2004. Hands-free operation. Requires VS-1/1L/1SL VOX unit for use. High sensitivity microphone for clear audio in noisy environments. Icom BP-263 Battery Case (6x Alkaline AA/LR6 batteries) for use with Transcievers.